Sweden’s immigration policy is honourable but has not come without social problems — which in turn herald a political shakeup. Sweden has accepted more refugees per capita than any other European country. At the height of the European refugee crisis in 2015, Sweden accepted 10,000 refugees per week. Sweden’s liberal immigration policy is honourable, but it does not come without problems. As social problems increase, Sweden’s far right party, the Sweden Democrats (SD) are gaining territory and will likely be the major winner in the next election. Sweden has 53 areas defined as particularly vulnerable areas, vulnerable areas, and risk areas. 15 of these areas are particularly vulnerable and are primarily located in the suburbs of Stockholm, Gothenburg, and Malmo. The National Operations Department (NOA), part of the Swedish police, defines particularly vulnerable areas as areas where the safety and security situation is difficult or impossible to control. Attacks against police officers are common, particularly during arrests. The most notable outbreak of violence occurred in 2013 when hundreds of cars and schools were set on fire and police were attacked in Stockholm’s poorer suburbs. Intimidation of witnesses to crimes that could testify in court is common, which undermines the legal system. NOA also mentions that particularly vulnerable areas in Sweden have parallel society structures, or their own norms, economies, and legal systems. Violence is a regular occurrence and can happen during the day and put innocent bystanders at risk. The level of violence is increasingly deadly, particularly between different criminal constellations. Religious extremism is present in a third of these areas with intolerance against moderate Muslims and individuals travelling to join foreign terrorist groups. The number of particularly vulnerable areas will most likely increase. A major reason is that Sweden, for all its good intentions, has failed to integrate newcomers into the labor market. A segregated housing market and school system are some of the root causes for why many newcomers fail to receive adequate education and become competitive enough to successfully enter the labor market. Sweden’s liberal immigration policy, with the Swedish Migration Agency projecting at least 250,000 new immigrants arriving over the next five years, undermines integration efforts and adds to the exclusion felt by many of the immigrants already living in Sweden. As prospects fade, hopelessness and resentment grows. Feelings of social marginalization and frustration create an environment where immigrants become more susceptible to recruitment into criminal groups, and in worse case scenario, terrorist groups. Sweden is vulnerable to terrorist recruitment by Salafi-Jihadist groups, primarily the Islamic State. The International Centre for the Study of Radicalization and Political Violence at King’s College in London estimates that Belgium, Denmark, and Sweden have more citizens fighting in Iraq and Syria per capita than any other European country. The Soufan Group assesses that 300 individuals have left Sweden to join the Islamic State in Syria and Iraq. Analysis by the Swedish Security Service indicates that more than 15% of people leaving Sweden to join foreign terrorist groups were born in the Horn of Africa and 40% were born in Sweden to at least one foreign-born parent. Individuals leaving Sweden to join foreign terrorist groups represent 30 different nationalities and most recruits were born between 1985-1994. The Swedish Security Service has also observed a new trend. Fewer people are traveling to conflict zones, but the numbers of individuals who are sympathising with Islamic terrorism are increasing. For example, Goteborg Posten – a Swedish newspaper – featured an October 2016 survey that found among 1,200 students aged 12-18 years old in Gothenburg’s particularly vulnerable areas, more than 11% expressed sympathies with the Islamic State and at least 13% knew someone that sympathised with the Islamic State. The European Parliament observed in the report “2016 Labor Market Integration of Refugees” that labor market participation is the single most important step toward successful integration into host societies. Sweden has failed in this regard. Data released by Statistics Sweden (SCB) in January 2017 shows that it takes an average of nine years for half of all refugees that arrive in Sweden to enter and establish themselves on the Swedish labor market. It is harder in some cities. For example, only 36% of all refugees who arrived in the third largest city, Malmo, in 2004 had a job ten years later. Adequate education is often seen as a pre-requirement for a successful entry into the labor market. The school system and housing market demonstrate profound segregation. An October 2015 survey of 38 urban districts shows a 78-88% composition of immigrants born outside Europe. Herrgarden in Malmo has a 96% share of immigrants born outside Europe. Housing segregation is also a partial explanation for the school segregation and the challenges that students in these areas face. It is estimated that the number of students with immigrant backgrounds from outside Europe who fail to qualify for Swedish high school education has increased from 25% to 40%. This is a view supported by the Organization for Economic Co-Operation and Development (OECD), which criticises Sweden for continued gaps between immigrants and native-born students. OECD estimated in 2015 that almost one in two immigrant students (48%) perform below the baseline in mathematics compared with 22% for native-born students. School segregation cannot only be explained by housing segregation, but also an acute shortage of teachers and charter schools that allow students from better socio-economic backgrounds to pay for better schools and education. As social problems take root in Sweden, the anti-immigration party – the Sweden Democrats (SD) – is gaining political ground. SD will most likely be declared the major winner in the 2018 Parliamentary Elections. This assertion is based on several factors. Foremost, the general reluctance among the traditional political parties to discuss social problems and economic costs associated with Sweden’s liberal immigration policy. 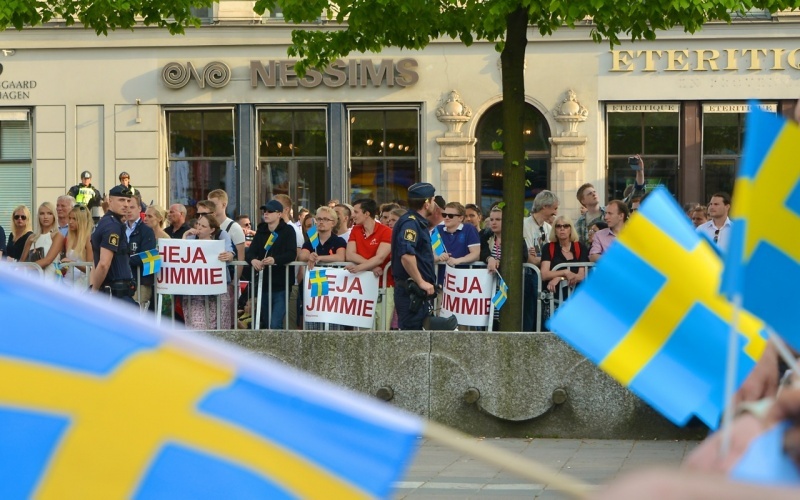 Discussions over immigration and integration are highly sensitive issues in Swedish politics. This unwillingness in turn has created a vacuum and niche area that SD has exploited and filled. This is evident in SD’s increased popularity at every national election since the party entered the Riksdagen (Swedish Parliament) in 2010 with 5.7% of the national votes. In the 2014 election, SD gained 12.9% of the votes. In a sense, SD’s success can be viewed as the voter’s verdict on how well the country is handling immigration and integration. Recent national opinion polls indicate that SD enjoys between 17% to 26% support among voters. National polls leading up to the 2014 Parliamentary Election was not close to these numbers. In the months leading up to the 2014 election, SD enjoyed between 8-10%. Previous elections have also proved that SD received somewhat higher support than the national polls indicate. Based on national polls, it is plausible that SD could become the second largest political party next year. A national survey by Dagens Nyheter/Ipsos conducted in January 2017 indicates that half of all voters believe Sweden is heading in the wrong direction. Voters are primarily concerned with immigration, integration, crime, and the healthcare system. The social democratic government’s failure to handle the refugee crisis in the summer and fall of 2015 has likely served as a turning point. Expect immigration, integration, and law and order to be the major topics in the Swedish election year. These topics also happen to be the core questions of SD, which is an indication that SD is in sync with sentiments across the country. On a final note, anticipate the pre- and post-election periods to expose a strongly divided nation over immigration, integration and crime. No Immersion, No Assimilation, plenty of handouts and this is what you get.